Lahore : After a disappointing 2-2 draw in the opening test, Pakistan displayed a vastly improved game in all the departments to defeat Oman 6-1 in the second test of 4-Match Pak Oman under 18 hockey test series at Lahore’s National Hockey Stadium. The hosts made a statement of intent as early as the third minute when a left side attack found Awais at the top of the circle and he opened the account with a well- placed push which deceived the entire defence. Pakistan continued with well combined moves and regularly entered the opponent’s circle. The lead was doubled in the 16th minute when a wonderful Moeen Shakeel cross from right beat the entire Omani defence and Naveed Alam at the far post easily put the ball in. Pakistani attacks came in waves and the 19th and the 21st minutes saw two more goals. Khairullah scored off a rebound after a fine move from the left side. Then Naveed Alam in a moment of genius eliminated three defenders with delightful stick work before hitting the target. Though, four goals down, Oman fought back and earned two penalty corners in a short span. But the drills couldn’t be completed due to fine interception by the Pakistani defenders each time. They also benefited from five minute suspension of Pakistan’s Amjad Ali. Although their own Rashad Hamad was also sin binned for two minutes. Last 10 minutes saw up and down game. Some good chances came to Pakistan’s way in the last five minutes but were not availed. It was 4-0 after the first half of 35 minutes. Pakistan started from where they had left. 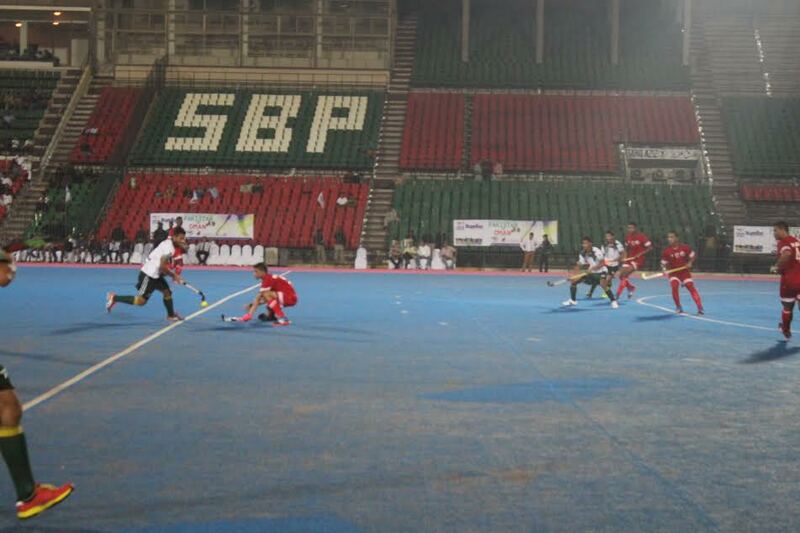 Just four minutes had passed when unmarked Afraz at the top of the circle scored with an angular hit. Then the 41st minute witnessed another beautiful goal. Ali Aziz made a wonderful foray into the circle and slipped the ball to Afraz who made no mistake from a good position and it was 6-0. Just two minutes later, Pakistani defence blundered and visitors Adnan Abdullah, unmarked at the top of the circle, easily netted his side’s first goal. Oman continued to strive. First, a close range chance was well stopped by Pakistani net minder Waqar Younis and then off another penalty corner, the flick went high over the bar. Some pole to pole stuff was seen for a while with both sides entering opponents’ circles. Pakistan had better opportunities but couldn’t add to the score. Oman’s fourth penalty corner wasnt stopped at the top of the circle. Pakistan’s only two penalty corners came in the last five minutes. Omani goal keeper brilliantly saved both attempts by Amjad Ali: first a low push and the second a high flick.